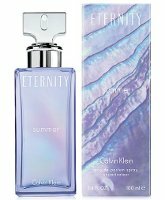 Calvin Klein has launched the annual limited edition summer versions of 1988's Eternity and 1989's Eternity for Men. Eternity Summer (shown) ~ "fresh. calm. elegant. Eternity summer captures the natural beauty of seashells glistening in the sand on a warm summer day." With notes of seabreeze, aquatic accord, bergamot, wisteria, living cotton flower, osmanthus, musk, white amber and sandalwood. In 100 ml Eau de Parfum. Eternity for Men Summer ~ "Fresh. Calm. Confident. Eternity for Men Summer opens with a fresh burst of tarragon, a heart of seagrass and a warm driftwood accord at the base. This fragrance embodies a warm summer afternoon at the beach, exploring the treasures washed up along the shore." In 100 ml Eau de Toilette. The Calvin Klein Eternity Summer 2013 fragrances are available now at Macy's. living cotton flower??? So an ordinary cotton flower is dead? The only scents that I use and really love from Calvin Klein are the Obsession for men and woman. The rest, I don’t like it, they smell all the same to me. Espcialley CK One. How many different packages are there coming yet of CK One? When they append “living” to a fragrance note, it usually means they used headspace technology to develop the molecule. CK One — I don’t know, a LOT! Living lawn clippings, dead driftwood washed on shore with foam slime, and embodiment of fetid marketing excess. Coming soon to a TJMaxx near you. Sadly I don’t smell them enough to know. I expect it to smell just like the summer editions from years past, but this is BY FAR the most beautiful bottle/box so far!